One of the most beautifully illustrated comics of the year arrives in 'Isola' from Image Comics. 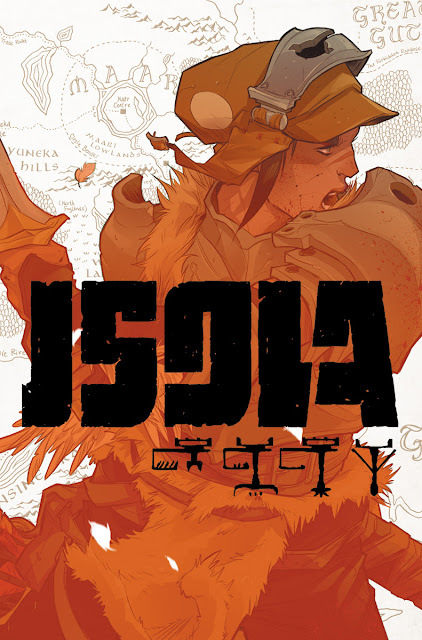 'Isola' is a rare comic that thrives, breathes, and soars through its art. Such storytelling takes a team of talented people like Brenden Fletcher, Karl Kerschl, Karl Kerschl, Msassyk, and Aditya Bidikar. More than your usual fantasy comic, the creative team works as one living organism where there is no defining line between script, pencils, colors, and letters. It's all incorporated in each panel within a scene, a look, a sound effect, a tonal shift with color, creating a symphony of sight and emotion in one grand adventure. The story itself revolves around a loyal and brave soldier named Rook escorting a beautiful black and blue tiger through a lush landscape full of familiar and not-so-familiar sights. The tiger is apparently Queen Olwyn who's been cursed and transformed into an animal. Rook continues to revere her as the royalty that she is despite the change. Olwyn isn't the talking animal type so all the essential exposition comes from Rook speaking to her about where they're going and how she'll protect and serve her. Fletcher and Kerschl build this world as Rook and Olwyn explore it. We're seeing it as they are and with every turn comes a new look at this vast and dangerous landscape. The transition from night to dawn by Msassyk is gorgeous. The moonlit blue that encompasses the environment to open the story gives way to brighter reds and oranges illuminating the jungle as if the sun was rising in real time. Along the trail, they encounter a hungry stampede of animals on way to the carcass of a fallen giant bird known as a Hallum. A feast for hungry carnivores, one not even the Queen could resist her primal urges. Their journey to the promised land of the mythical Isola so far is an engaging and wondrous affair that must be seen as well as read to be appreciated. 'Isola' is a sweeping fantasy that immerses the reader immediately with stunning visual storytelling. It's as though each panel is an animation cell all its own. Coupled with a mysterious curse and an intriguing mission, 'Isola' is off to an impressive start. It's a must-have title that's as imaginative and expertly executed as you'll find in comics this year.